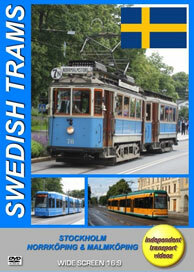 This DVD programme looks at the trams of Stockholm and Norrköping and pays a visit to the lovely Tramway Museum at Malmköping. The capital of Sweden is Stockholm; situated in the east of the country it is surrounded by the waters of Lake Malaren and has many small islands within its environs. It has a superb transport system including trams, light rail, buses, and metro as well as regional and suburban railways. This DVD programme features the trams and light rail, with some buses shown as they interact with the trams. Modern trams only returned to the streets of the city in 2010 as the original system, dating back to 1877 became obsolete in 1967 when the rule of the road changed. The Stockholm section on this programme is arranged by tramway/light rail line. We begin in the city centre and show the trams operating on Line 7, the ‘Spårväg City’ line. A fleet of six Bombardier Flexity Classic trams, classified as Type A34 are used. We also see some new CAF (Type A35) trams running on Line 7, a type soon to be introduced as the original A34s will move to Norrköping in 2018. Our cameras film Line 7 trams at various locations including Nybroplan, Strandvägen and Hamngatan. We then look at Line 12 – ‘Nockebybanan’. Riding on a Bombardier Flexity Swift, (Type A32) tram, we travel to Nockeby and then ride back to Höglandstorget where we change to tram 423 for a driver’s eye view to Alvik. The next route to feature is Line 22, known as ‘Tvärbanan’. On this line we ride on Bombardier Flexity Swift trams 409+412 to Gröndal where we change to similar trams 424+426 to get the driver’s eye view as we ride to Gullmarsplan. Our cameras now return to the city centre for a real treat! Line 7 is shared by the historic trams that run the 7N service. This heritage service operates at weekends, holidays and certain dates throughout the summer months. Our cameras ride on 76, a ASEA (Type B19) car dating from 1926 with trailer 846, a ASEA (Type A1) car dating from 1929 to Gröna Lund. From here we ride on 333 a Hägglund (Type A31) “Mustang” tram from 1947 to Skansen. For comparison we travel on cars 3 and 6, Bombardier Flexity Classics (Type 34) along Line 7. Our final rides are on the ‘Lioingöbana’ – Line 21. Here we travel on the new CAF Type A36 cars 553 and 554 to Gåshaga brygga and back. We complete our travels in Stockholm with a visit to the city’s excellent Transport Museum. Our cameras now move some 160km southwest of Stockholm to the small city of Norrköping in Östergötland County. The trams are operated by Veolia Transdev, but are owned by the city. At the time of filming, in July 2016, the fleet was made up of 15 Bombardier Flexity Classics and ten Duewag cars, with a centre low-floor section added, originally from Duisburg and Dessau in Germany. Filming takes place at various locations around the city including Norra Promenaden, Drottninggatan, Trädgårdsgatan and Östra Promenaden. This smart green and yellow fleet makes a pleasant change to the blue and white liveries of the other Swedish tram fleets! To conclude our programme we visit the lovely Tramway Museum in Malmköping, which is some 70km north east of Norrköping. It houses trams from all of the former Swedish tramway companies. We ride on three trams, two from Helsingborg and one from Gothenburg and see the other exhibits on display. The museum also includes buses and a trolleybus. This is a fitting end to our visit to the Swedish capital and to one of Sweden's smaller cities. We hope you enjoy your visit!